The premiere Mexican soccer league – Liga MX – is coming to FOX Sports Arizona and FOX Sports Arizona Plus! Beginning July 21, nine soccer matches featuring the Tijuana Xolos will be televised in English throughout Arizona and New Mexico. Founded in 2007, Club Tijuana Xolos is one of the youngest clubs in Liga MX and one of the only bicultural Liga MX teams. Liga MX is comprised of 18 teams and began play 70 years ago. It has grown to become the top level of the Mexican football system, is considered the strongest in North America and among the strongest in all of Latin America. Home to a highly passionate fan base, it’s the fourth-most attended football league in the world, trailing only Bundesliga, Premier League and La Liga. 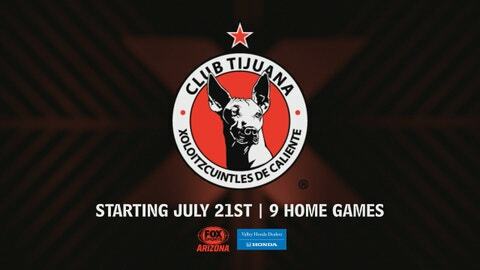 Tijuana Xolos matches on FOX Sports Arizona and FOX Sports Arizona start July 21 when they host Chivas de Guadalajara on FSAZ. It will be a tape delay telecast at 10 p.m. that night following the D-backs and Rockies game. All nine matches will also be streamed on the FOX Sports GO app. Aug. 31 – Tijuana vs Necaxa, FOX Sports Arizona Plus, 7 p.m.
Oct. 6 – Tijuana vs Gallos Blancos de Queretaro, FOX Sports Arizona Plus, 7 p.m.